This morning's weekly jobless claims number was only slightly better than expected, but that was all it took to get traders optimistic about tomorrow's monthly employment report. Similar to the ADP reading earlier this week, analysts are looking for about 175,000 new jobs to have been added in the month of January. You might recall the previous report of 74,000 (blamed on weather). We suspect this has been relatively accounted for in today's rally. If so, anything below the 175,000 mark could trigger a retest of the lows. Anything in excess would likely see a (potentially temporary) rally in equities. Obviously, the Treasury market would behave in the opposite manner. In our best estimation, the current counter-trend move could extend itself moderately, but once we get past the jobs numbers the markets might refocus on the fact that economic data has softened and the Fed is pulling the punch bowl away. 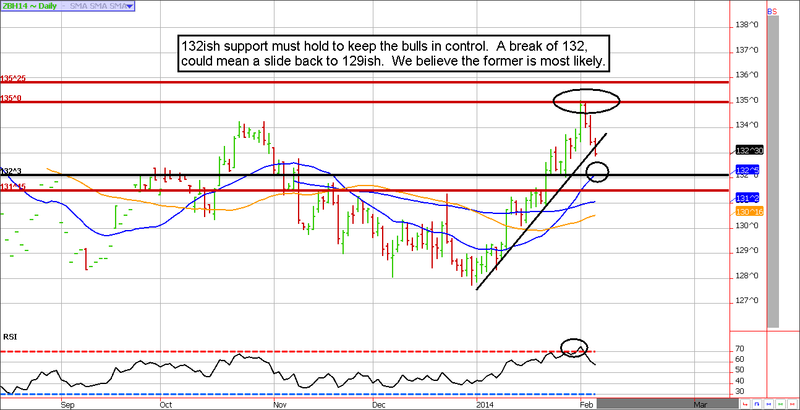 We aren't shocked that technical resistance near 135 in the ZB held so well, but we are disappointed in our failure to do anything about it. Nonetheless, we aren't convinced the bears are in control. The current pullback could easily see 132ish, but support at this level has a good chance at holding (unless the employment report is a miraculous surprise). The COT stats were interesting this week. Large speculators (thought of as the smart money), doubled their modest short positions on last week's 10-year note rally, but the small traders were squeezed out of about 20% of their position (they bought them back). The way we see it is that the small speculators still have plenty of contracts to unwind, and the large speculators might be tempted to take quick profits on their bearish positions. In other words, don't assume that logic will prevail...lower interest rates and higher Treasuries are more probable than not. Position squaring and emotion typically trumps fundamentals. **Consensus:** a dip to 132ish might be bought into. We aren't convinced that 135 will be the high of this move. Today's rally was impressive, and likely has many bears second guessing their stance. However, it has been very clear that 2014 is not shaping up to be a repeat of 2013. Buying a dip to the 100 day moving average worked like a charm last year, but caused a significant amount of pain to those that attempted to do it last week. The S&P is currently trading above its 100 day moving average. This is a glimmer of hope for the bulls...and if the employment report is a gang buster surprise perhaps the market will return to its former glory. Nevertheless, we believe the odds suggest otherwise. We aren't saying the S&P can't bounce into the mid-to-high 1780s, but until we see a close above 1800 we'll continue to work on the premise of a weak market. Don't forget, the January barometer doesn't paint a rosy picture of the equity markets and February is one of the weakest months of the year on a seasonal basis...so there might be more pain to come. **Consensus:** It's been a while since we've seen this kind of volatility...but in the big picture it is a drop in the bucket. 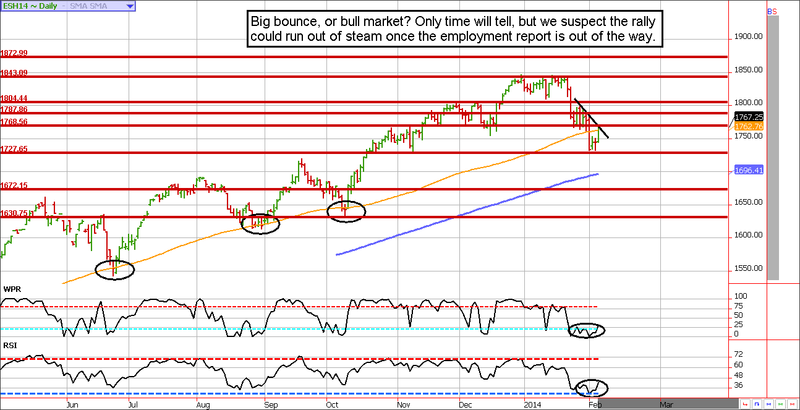 We believe the path of least resistance will be lower overall, but the bounces can be big. Only a close over 1800 puts the bulls back in charge.